Many people think photography is simple, but there’s so much work and skill involved. It takes a lot to get those stunning images of a bride and groom! To show you what shooting a wedding looks like for me, I broke down the whole day for you. When it comes to shooting a wedding, I always have an assistant. Weddings can be very hectic, and it helps to have another person with me. My assistant helps me with lighting, so I can get those epic shots that brides and grooms love! They also help me to stay organized, keeping track of time and getting anything I or anyone else involved in the wedding may need. This is a huge job, and I’m so grateful for the help of my assistants in making sure things run smoothly! I always start my wedding shoots off by capturing details: the dress, the rings, the shoes, and any other items that are special to the couple. After details, I spend time with the bride and her girls to capture images of them getting ready. 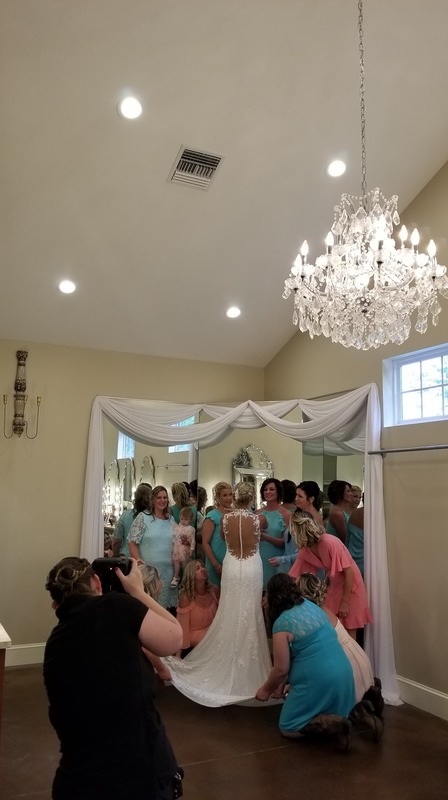 Of course, this means shots of makeup and hair, but it’s also a great time to capture candid photos of the bride and her relationships with her friends! Plus, we do fun shots like the bride and bridesmaids in their robes or popping a bottle of champagne! Once everyone gets dressed, I’ll do portraits of the bride and the bridal party, if there’s time before we head to the ceremony. And then, of course, I’ll photograph every moment of the ceremony, from the walk down the aisle to the first kiss! After the ceremony, I usually do all the traditional photos that your family loves—formal shots of the bridal party, family, and finally the bride and groom. Then it’s time to party! The reception is just as full of events to capture as the ceremony itself. I love the intimacy of the first dance and the sweetness of the father/daughter and mother/son dances! From dinner to dancing to the cutting of the cake, I’ll be there to capture every moment, with my assistant helping me along, of course. Once the dance floor is open, I try to sneak the bride and groom away for some private sunset photos. These are always some of my favorite images! Finally, the day ends with the bride and groom exiting the reception. Both sparklers and bubbles are popular choices, but my personal favorite is confetti! I just love all the colors! Shooting a wedding is an exhausting and rewarding job, and I wouldn’t change a thing about my life as a photographer!